As expected Google has taken the wraps off the full version of its Google Music application, which now features a fully functional MP3 download store. At an event in Los Angeles on Wednesday afternoon, Google announced partnerships with EMI, Sony and Universal Music to provide the same high-quality 320KBps MP3s hosted by iTunes. However, the fourth of the big four record labels, Warner Brothers, is conspicuous by its absence confirming rumours that Google had failed to lure all of the big players into agreements before launch. However, Google Music will still give users access to 13 million songs that can be instantly downloaded to their Android device or Google TV. On top of that, artists will have their own hubs where they can sell music and there's be a host of exclusive tracks and albums, like an unreleased Rolling Stones Live concert Google mentioned during the event. However, as expected, UK users will have to wait to go hands on with the new-and-improved service. 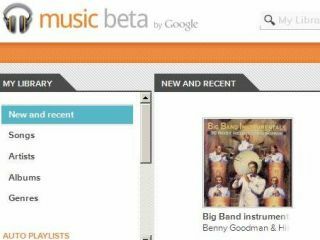 Google has also taken the opportunity to bring its original Google Music cloud storage offering out of Beta for the 1 million users already taking advantage of the service. The storage option, which is now free to all, allows you to upload 20,000 songs to the cloud, which can be streamed to any of your connected devices. Users have complained, however, that the uploading process takes an inordinate amount of time. This portion of the service will rival Apple's $25 iTunes Match streaming facility, which simply scans your hard-drive and replaces tracks with high-quality offerings from iTunes. The other big news to come form Wednesday's launch was Google's plan to deeply integrate the Music service into its fledgling Google+ social network. The company has said that users will be able to share albums and songs they have purchased with their Google+ Circles, who can then stream them completely free without making a purchase. All of the action takes place on your Google+ profile page and is similar to Facebook's tie-in with Spotify which allows users to recommend songs to pals. Google has already updated its Google Music Android app and is also rolling-out an update to the Android Market itself to include a Music tab to sit alongside Apps, Books and Movies. This is unlikely to immediately roll-out in the UK as Google will need to negotiate deals with the British arms of the major record labels, but we'll keep you updated.